Most majestic of the great British theatre ladies, whose successes embraced virtually all the challenging classical roles for women (Medea, Lady Macbeth, etc) and who, in 1924, indelibly stamped Shaw 's St Joan (which he wrote for her) with her own kind of moral power. Trained at Ben Greet's Academy, on stage from 1904, an indomitable touring player as well as a mainstay of the Old Vic for decades, she dealt only sparingly - but memorably and sometimes ambitiously - with the cinema. 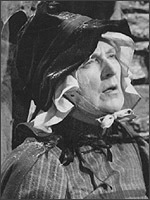 She 'gave' some of her famous stage roles in the silent anthology Tense Moments from Famous Plays (d. Harry B.Parkinson, Edwin J.Collins, Challis N.Sanderson, 1922) and was a famous Edith Cavell in Dawn (d. Herbert Wilcox, 1928); she was Belle Crystall 's grim old mum in Hindle Wakes (d. Victor Saville, 1931), Nova Pilbeam 's warm-hearted nurse in Tudor Rose (d. Robert Stevenson, 1936), the Salvation Army General in Major Barbara (d. Gabriel Pascal, 1941), and the vile old harridan, Mrs Squeers, in Nicholas Nickleby (d. Alberto Cavalcanti, 1947). She brought a breath of life to The Prince and the Showgirl (d. Laurence Olivier, 1957) as the Dowager Queen, and was last seen as the Nurse in the definitive Chichester production of Uncle Vanya, filmed for TV in 1963, released in 1977. She seems almost a force of nature, very nearly too 'large' for the screen, so that it is a matter for thanks that some sense of her formidable gifts has been marshalled to its scrutiny. Married to Sir Lewis Casson , with whom in her later decades she gave many poetry recitals. She was heaped with honours, including DBE, 1931. Sheridan Morley, Sibyl Thorndike, 1977. Rural melodrama of a young woman pursued by predatory men.